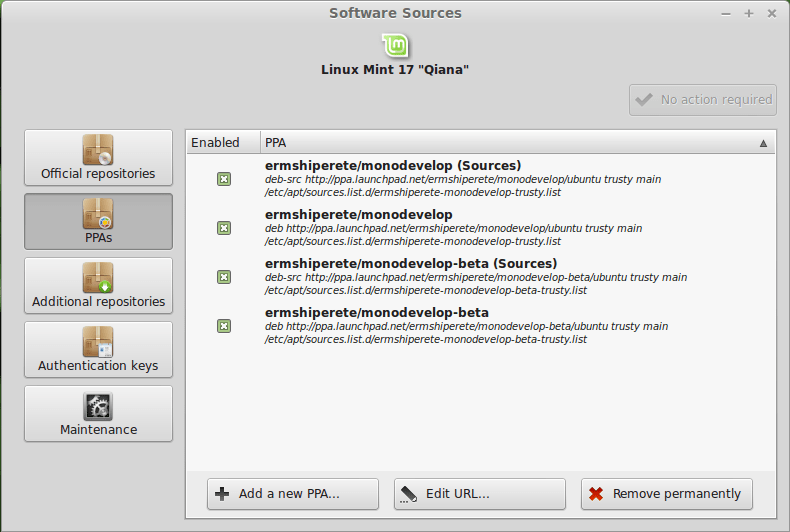 To add ppa with the last MonoDevelop stabile version on Linux Mint we can use a program called “Software Sources”. Or do the following steps in command line and this should work on any Debian flavour. MonoDevelop as well as new version of Mono framework will be installed in /opt/monodevelop. $ sudo mozroots --import --sync $ sudo certmgr -ssl -m https://go.microsoft.com $ sudo certmgr -ssl -m https://nugetgallery.blob.core.windows.net $ sudo certmgr -ssl -m https://nuget.org $ sudo certmgr -ssl https://nugetgallery.blob.core.windows.net Mono Certificate Manager - version 3.2.8.0 Manage X.509 certificates and CRL from stores. Copyright 2002, 2003 Motus Technologies. Copyright 2004-2008 Novell. BSD licensed. X.509 Certificate v3 Issued from: C=IE, O=Baltimore, OU=CyberTrust, CN=Baltimore CyberTrust Root Issued to: CN=Microsoft Internet Authority Valid from: 4/25/2012 5:41:36 PM Valid until: 4/25/2020 5:40:55 PM *** WARNING: Certificate signature is INVALID *** This certificate is already in the CA store. X.509 Certificate v3 Issued from: CN=Microsoft Internet Authority Issued to: DC=com, DC=microsoft, DC=corp, DC=redmond, CN=MSIT Machine Auth CA 2 Valid from: 5/15/2012 8:40:55 PM Valid until: 5/15/2016 8:50:55 PM *** WARNING: Certificate signature is INVALID *** Import this certificate into the CA store ?yes X.509 Certificate v3 Issued from: DC=com, DC=microsoft, DC=corp, DC=redmond, CN=MSIT Machine Auth CA 2 Issued to: CN=*.blob.core.windows.net Valid from: 7/17/2014 11:43:37 PM Valid until: 5/15/2016 8:50:55 PM Import this certificate into the AddressBook store ?yes 2 certificates added to the stores. This certificate is already in the CA store. 2 certificates added to the stores. One important thing to remember in App.config is that connectionString name attribute must have the same name as Context class, but without “Context”. For example MyDatabaseContext is our context class, the name of the connection string will be MyDatabase. Otherwise EF is looking for a standard SQLEXPRESS database on localhost. Another important thing is that Context class must have a constructor that calls the parent constructor with connection string name as a parameter. Enable and start migrations commands in Package Manager Console. MonoDevelop does not have Package Manager console that can run migrations commands. This can be done in Visual Studio only. PM> Enable-Migrations Checking if the context targets an existing database... Code First Migrations enabled for project EF6MySQL. Code First Migrations enabled for project EF6MySQL. No MigrationSqlGenerator found for provider 'MySql.Data.MySqlClient.EF6'. Use the SetSqlGenerator method in the target migrations configuration class to register additional SQL generators. The Designer Code for this migration file includes a snapshot of your current Code First model. This snapshot is used to calculate the changes to your model when you scaffold the next migration. If you make additional changes to your model that you want to include in this migration, then you can re-scaffold it by running 'Add-Migration Init' again. No MigrationSqlGenerator found for provider ‘MySql.Data.MySqlClient.EF6’. Use the SetSqlGenerator method in the target migrations configuration class to register additional SQL generators. To solve this the following line must be added to the Configuration.cs in Migrations folder. Target database is: 'Mydatabase' (DataSource: localhost, Provider: MySql.Data.MySqlClient.EF6, Origin: Configuration). EF creates a key on (MigrationId,ContextKey) which exceeds the hardcoded maximum key length constraint in MySQL. MigrationId is 255 characters long, and ContextKey is 512 characters long, but each char can occupy more than 1 byte, so mysql is complaining. The problem is described here http://stackoverflow.com/questions/20832546/entity-framework-with-mysql-and-migrations-failing-because-max-key-length-is-76 The solution is described here http://msdn.microsoft.com/en-us/data/dn456841.aspx. We basically have to tell EF it has to change the way it generates the __MigrationHistory table.